The early 1950s in England was an interesting time. WWII was just barely behind them, and the country was rebuilding itself and people reassessing their purposes in life. With survival of such a great tragedy comes guilt and determination that one's life count for something. Some went the direction of work that would serve others and some went the way of pursuing their dreams with abandon. DI Edgar Stephens, who had served in the war, now dedicated his life to pursuing criminals and making the world, or at least his world of Brighton, England, a safer place. Max Mephisto, Edgar's friend and fellow comrade in a special WWII unit called the Magic Men, chose to go back to his pre-war career of being a magician on stages across England and reaching for even grander spotlights than before. The world of variety entertainment has a fascinating history, and in the Stephens & Mephisto mysteries, the reader gets a front row seat to its changing times. The Hippodrome in Brighton serves as the venue where Max is currently performing in December of 1953, and that venue has a long, star-studded history, as well as an architectural one. Max calls his friend Edgar "a rarity, a completely honest man." So, we have two men who are friends and allies in spite of the different paths they take after the war, and who both end up helping to make the world a safer place with their parts in solving murders. Brighton is a comforting setting amidst the violence of murder, the sea and the history of the place providing a respite to the business of catching a killer. It is a snowy, cold December in Brighton as Christmas draws near in 1953. DI Edgar Stephens is looking forward to attending the variety show at the Hippodrome, where his friend Max Mephisto and his daughter Ruby are the headline act as Magician and Daughter. As Edgar is engaged to Ruby, it's especially a treat to see. But, duty comes first for Edgar, and he is called to the scene of an unusual murder. A young flower seller, Lily Burtenshaw, has been killed in her room at a local boardinghouse and the scene is quite odd, as the young woman appears to be posed in a scene of some sort. The bright, enthusiastic sergeant Emma Watson uncovers, after a bit of research, that the scene depicted by the murder victim is a famous painting of the death of Lady Jane Grey. The investigation of this gruesome murder by Edgar, Emma, and the other sergeant Bob Willis takes them once again into Max Mephisto's theatre world. As well as Max's and Ruby's headlining act and some smaller acts, there is a risque act called the Living Tableaux, in which scantily clad women portray scenes from history, not unlike the murder scene set-up. The coincidence doesn't escape Edgar, and two of the performers are also borders at the house where Lily Burtenshaw resided, and they might be the last two people to have seen Lily alive, besides the murderer. When there is a second murder that is directly connected to the Living Tableaux act, Edgar spends more time at the theatre investigating and talking to Max about events. Max's involvement with one of the Tableaux performers complicates matters and comes to have a great impact on the case. The conclusion to the case will have you on the edge of your seat and reading as fast as you can so that you can arrive at the moment of revelation and safety at last. 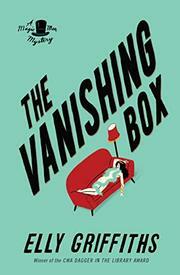 The Vanishing Box is the complete package. It is a paradise of great characters, both major and minor. Elly Griffiths will have you interested in every character you come across in this book. She's that good. There are so many characters and relationships evolving in this book, as even Bob Willis takes on more life and promise in this story, no longer in the shadow of Emma Holmes of the sharp mind and great instincts. Emma herself is deeply involved in every aspect of tracking down the ruthless serial killer, working closely with DI Stephens, with whom she is in love, despite his engagement to Ruby. Edgar's and Ruby's relationship gets some close scrutiny, too, and Ruby is given growth that I didn't expect. Nicely done. Max's role as Ruby's father is under the microscope a bit, too. Of course, one would expect the major characters to be so fully developed and evolving. But, the minor characters, from the showgirl Betty to the landlords Edna and Norris to Max's and Ruby's agent Joe Passilini to the manager of the Living Tableaux, Vic Cutler, to the old border Mr. Entwhistle, there is a definition to their development that brings them alive as much as the main characters. Character development is one of Elly Griffith's strokes of genius. With a mesmerizing, thrilling story and a setting that is historically accurate and intriguing, The Vanishing Box can't miss being a smashing hit.